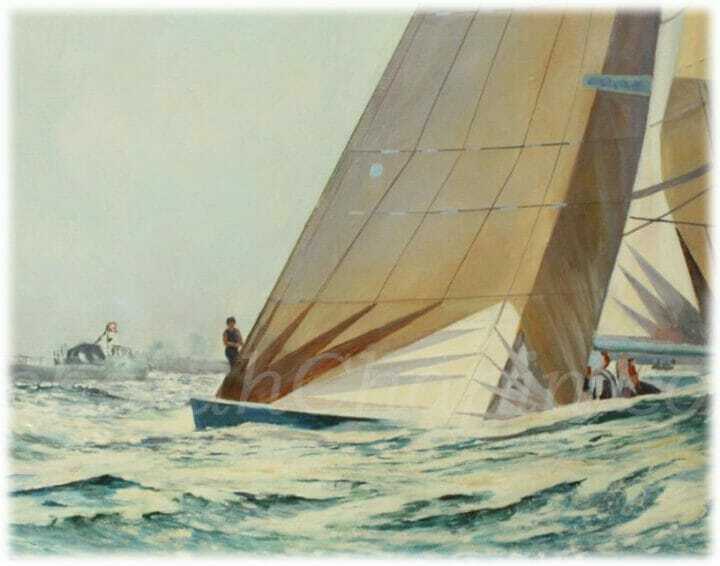 Categories: Buy a Canvas Print, Nautical Art. 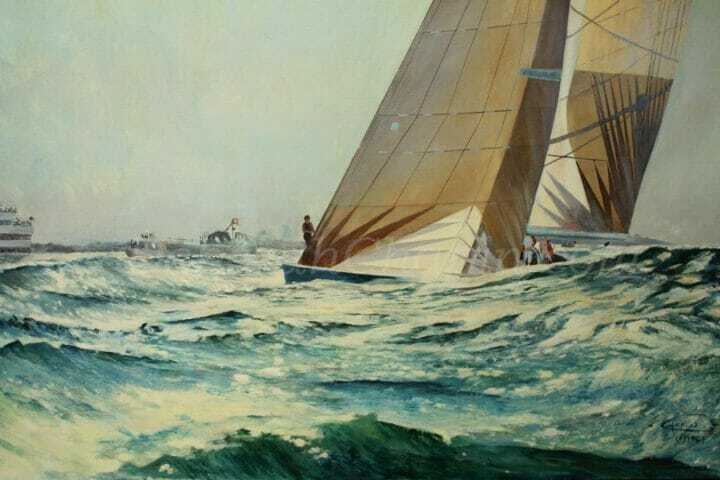 Tags: paintings, canvas prints, custom canvas prints, fine art, giclee print, giclee prints on canvas, marine art, nautical art, one-design racing, Ship paintings, wall pictures, water painting, yacht paintings. Read the whole story: This Nautical Art is an original oil painting, 25 x 35 inches painted with photographic references. On this particular day, the yacht depicted in the painting “Gunsmoke Blue”, resulted from a lucky opportunity. I was very fortunate to go out on one of the race committee tenders. We had just been at the last mark watching the rounding and in order to make it in time to the finish we had to go full throttle down the leg. We arrived at the pin end of the finish line and could see Stars and Stripes half way through the last leg of the regatta. Stars and Stripes had increased her lead over the frustrated Australians. The boat from San Diego was just minutes away from her rendezvous with history. I painted the moment when the gun went off signalling the finish and the American’s regaining the America’s Cup. This listing is for a canvas printed in pigment inks. printed in permanent pigment inks on archival canvas. I am a teacher in Sydney, Australia. This work really captures the beauty of the coast. Your virtual gallery is amazing! Thank you for sharing your wonderful work. Many thanks for this great collection, actually it is things like this which keeps my family on course via out my personal time. I am browsing around in this web site and had been thrilled as I located this item. Like a avid blogger, I’m blessed to see some others doing the same.